Our Knight Weather Vane was originally commissioned as part of a weathervane depicting Don Quixote Tilting at a Windmill. A second customer saw that weathervane and asked if we could make the knight as a separate weathervane. Of course, we were happy to do so but we needed to fatten the knight up a bit (Don Quixote was notoriously thin) and make Rocinante, his steed, slightly more noble in appearance. The weathervane you see here is the finished result. We have also used variations on this design to create our St. George and the Dragon and our St. Michael and the Dragon weathervanes. The saints’ regalia varies from vane to vane but we were able to employ this basic design for both sculpture pieces. Another Christian association with knights are the famous Templar Knights of the Crusades. 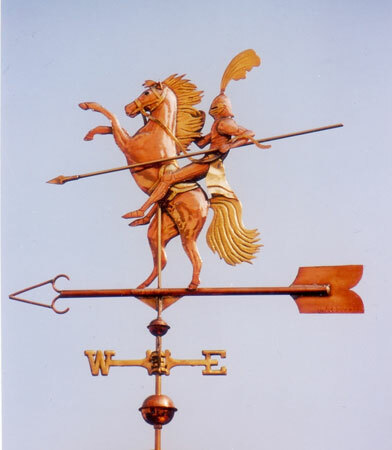 The Knight Weather Vane on Steed makes for a lively scene when paired with one of our dragon weather vanes. A customer ordered two weathervane to be placed in close proximity on two adjacent roof gables. When the wind blows one way our Web Winged Dragon Weather Vane chases the knight. When the wind switches direction our Rearing Steed & Knight Weather Vane challenges the fearsome dragon! As with all our weathervanes, each one is crafted to individual order and can be tailored to our customer’s personal preferences. For example, knights, representing valor and prowess, are often adopted as mascots for sports teams or other organizations. They are also incorporated in heraldic devices and coats of arms. If you have an idea about how this weathervane can be modified to fit your vision, please give us a call!